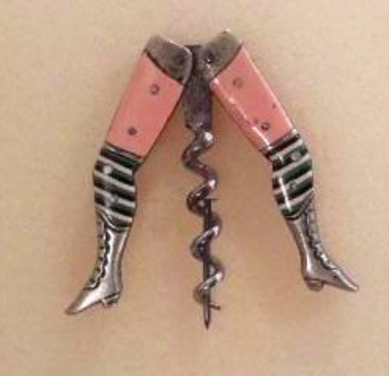 A couple of days ago, I caught wind of an estate sale that had a pair of ladies legs within its offerings, but given the location of the sale was 1670 miles away, I made contact with the estate sale person to see if they might be willing to sell them over the phone. The sale was to take place from Thursday through Sunday, so I sent an email, and also left a message. Having heard nothing over the weekend; no phone call, no email response, I figured either the person was too busy with the sale, or the legs had sold already. Today however, the person was apparently a little less busy, and we spoke briefly on the phone. Yes, the legs are still available, and yes she is willing to mail them to me. Now, on the estate sale website, the picture didn’t show both sides of the legs, and I will soon be receiving additional pictures. This pair is a full-sized pair of legs; half flesh with tricolored stockings. (I haven’t quite figured out why there is a nail inserted into the helix, but I am sure it will easily be removed). 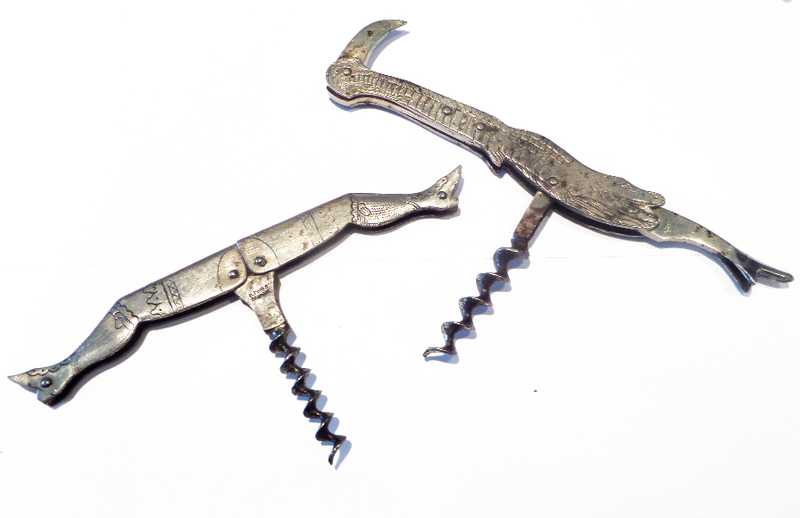 Also, I picked up a Williamson corkscrew advertising Williamson corkscrews; not a rarity mind you, but interesting nonetheless. Not too long ago, I managed to win a pair of legs on our second favorite auction site, and as they were in the UK, and the seller wasn’t willing to ship to the states, Petey was nice enough to receive the package, and then forward it on to me. They arrived today, and they are very nice! And, as soon as the lovely personal personal trainer saw them, she claimed them as her own. She is amassing a nice little collection!!! 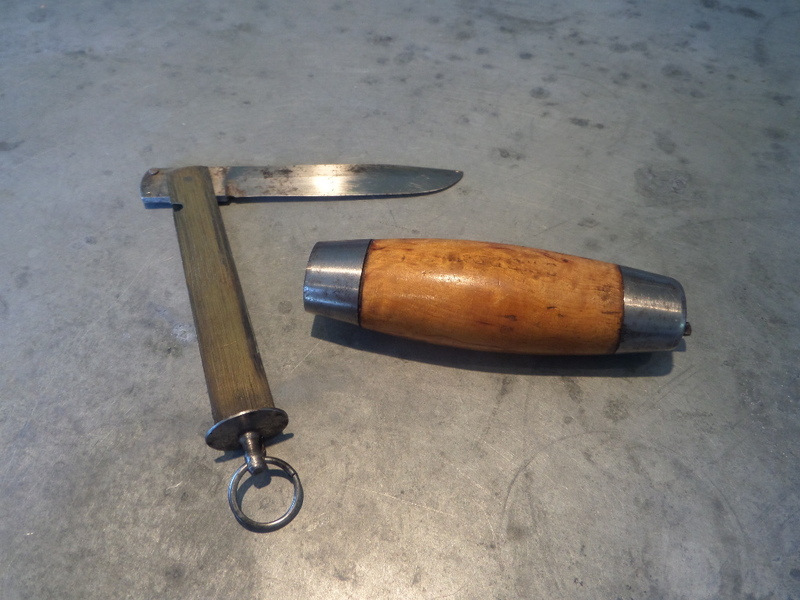 What makes this particularly interesting, is the handle is designed to have a full length knife blade, as it has the little cutaway where one would be able to fold out the knife. However, that it doesn’t have is a full length knife blade. 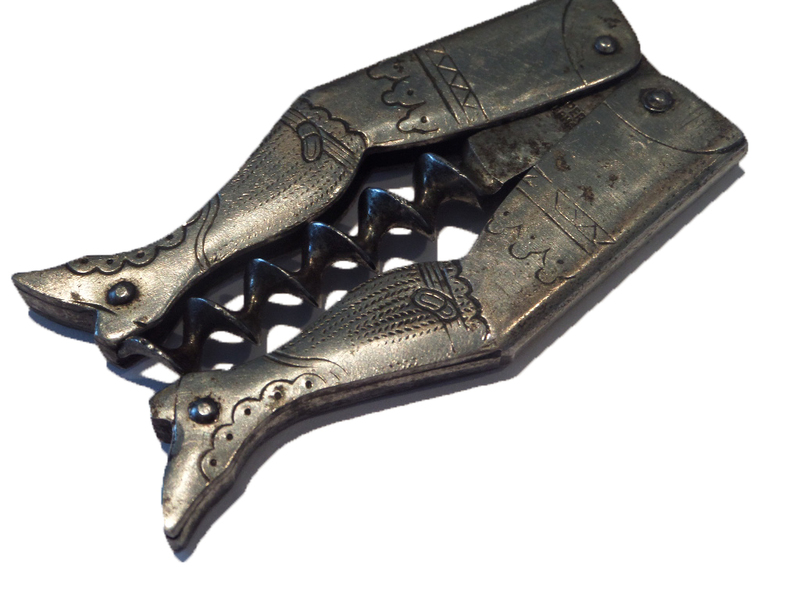 It has instead, the little hook champagne cutter blade. Now, one might ask, is the blade missing? 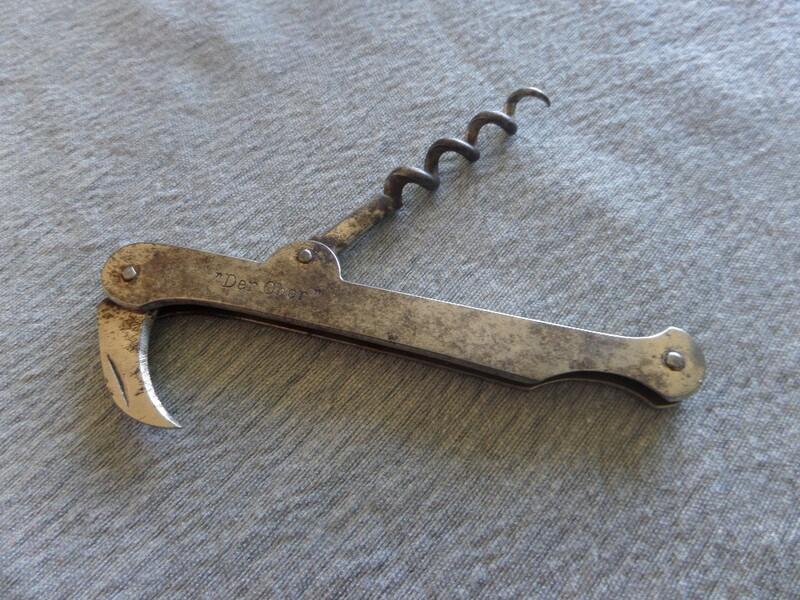 Is there a place where another blade, say folding the opposite direction might have been attached? 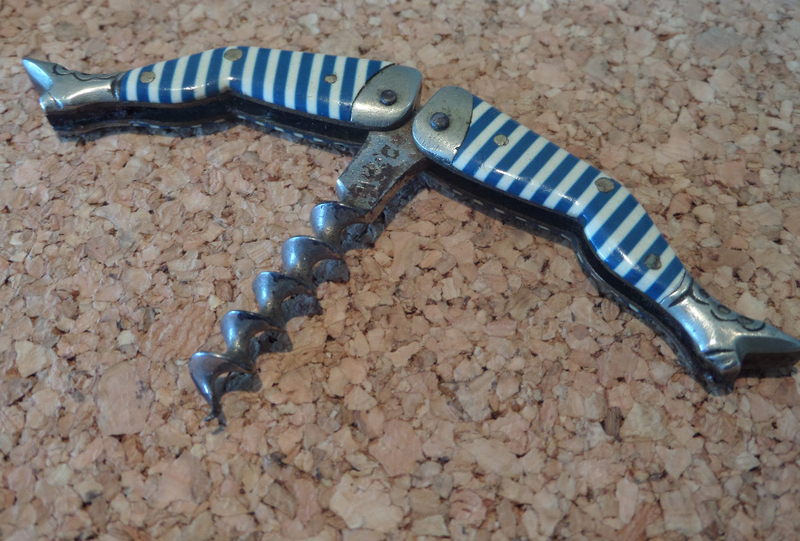 In conversations with Barry after I picked it up, we both came to the same conclusion, that whomever made the “der over” corkscrew, used a standard handle, and then affixed whichever knife blade was desired. 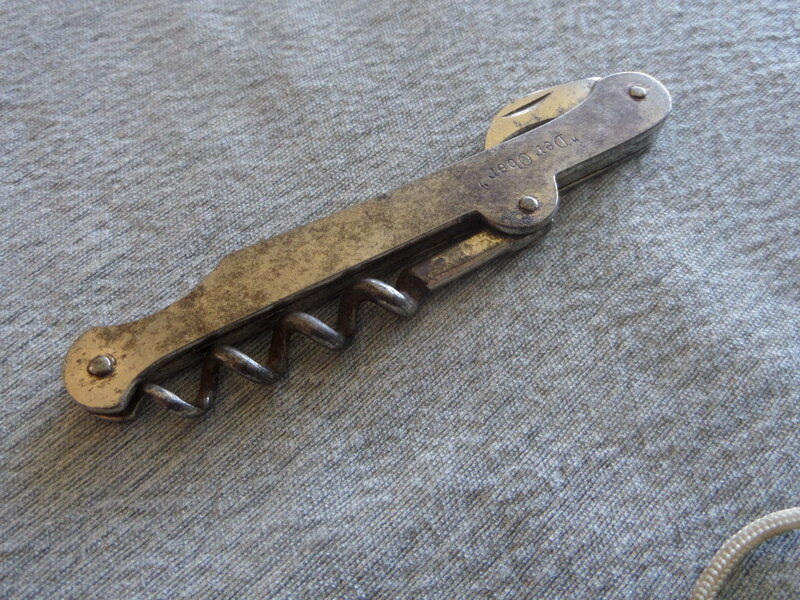 But, I would love to learn more about this particular corkscrew/champagne knife? 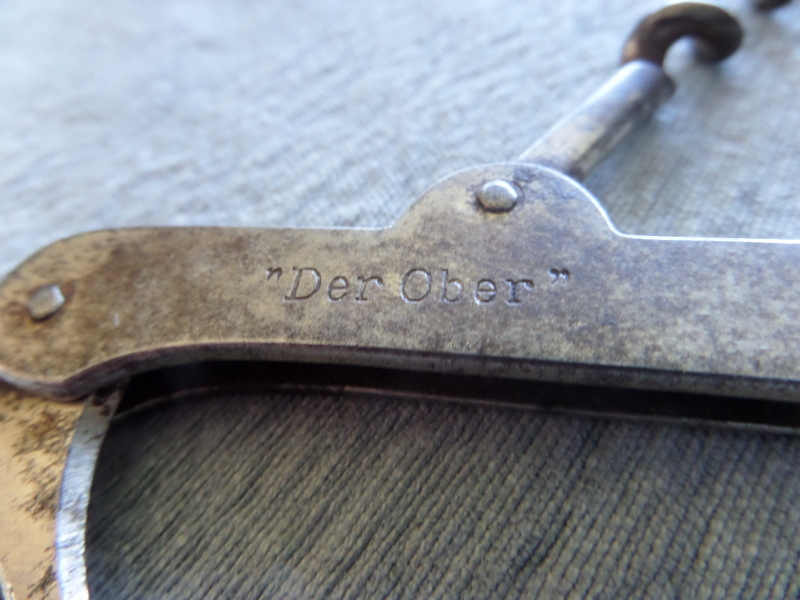 Does anyone else have a “Der Ober,” corkscrew? And, if yes, what blade is attached to yours? 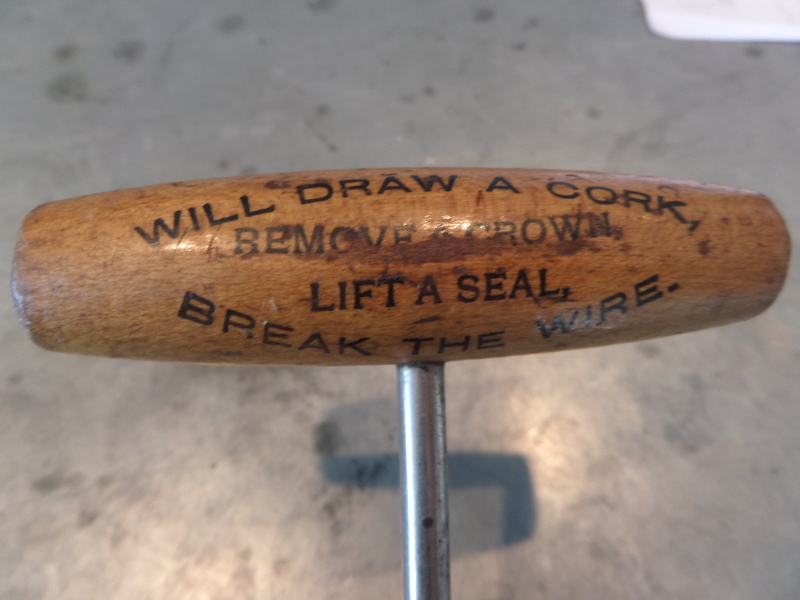 I walked down to the post office to mail off a couple of corkscrews to Tommy and Peter, and found a little note in my p.o. box that said I had a package. 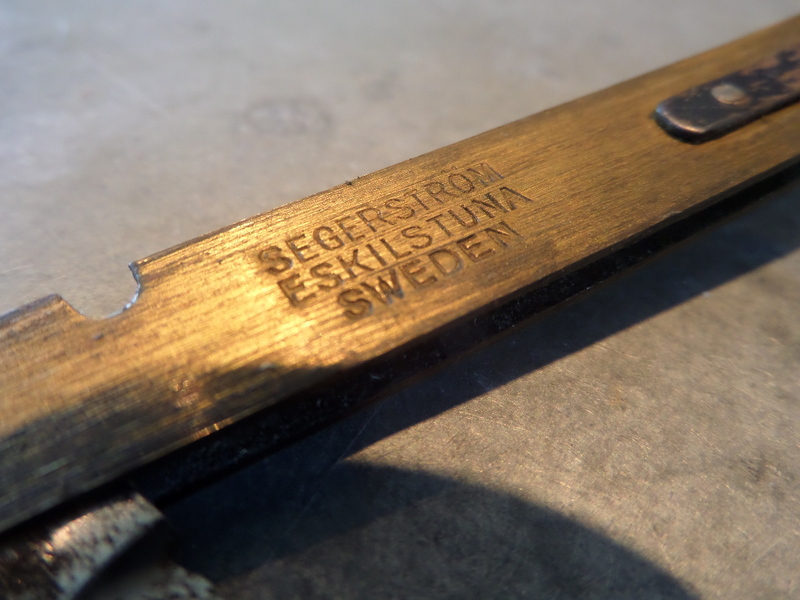 Along the way, I started to upon up the package, and retrieved the Swedish barrel knife mentioned the other day. 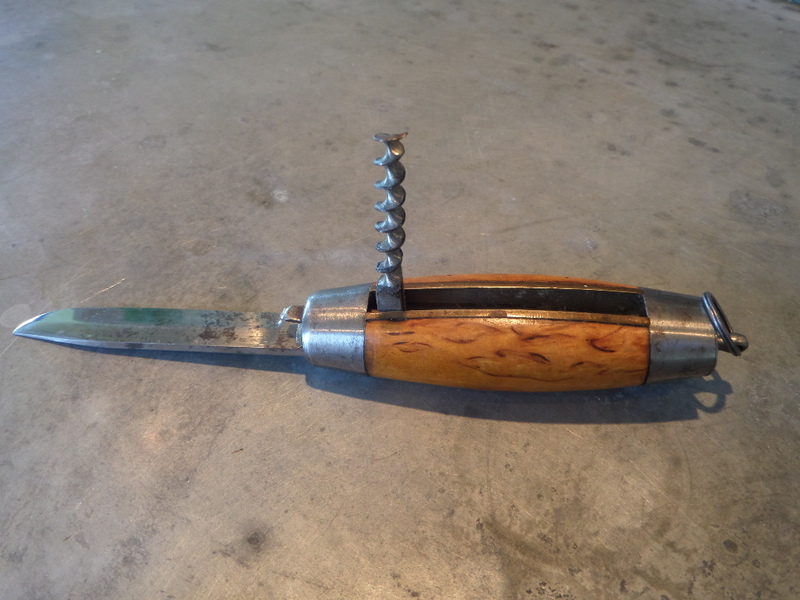 In the description, the seller explained that there was some other tool in the handle, but it was stuck. So, while I did have w-d 40 at the ready back at the house, I simply clicked the little release mechanism and the knife came sliding out. 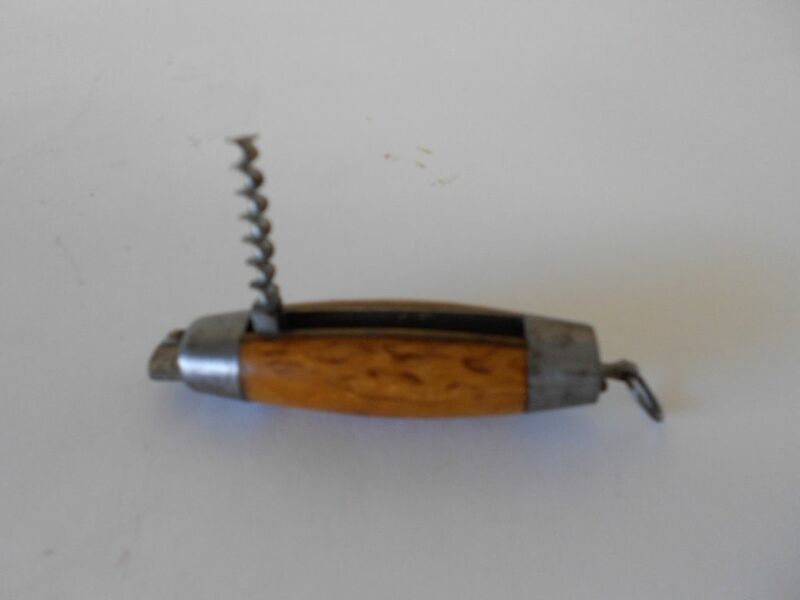 Apparently the seller didn’t know how the knife worked. And, it is pretty amazing. 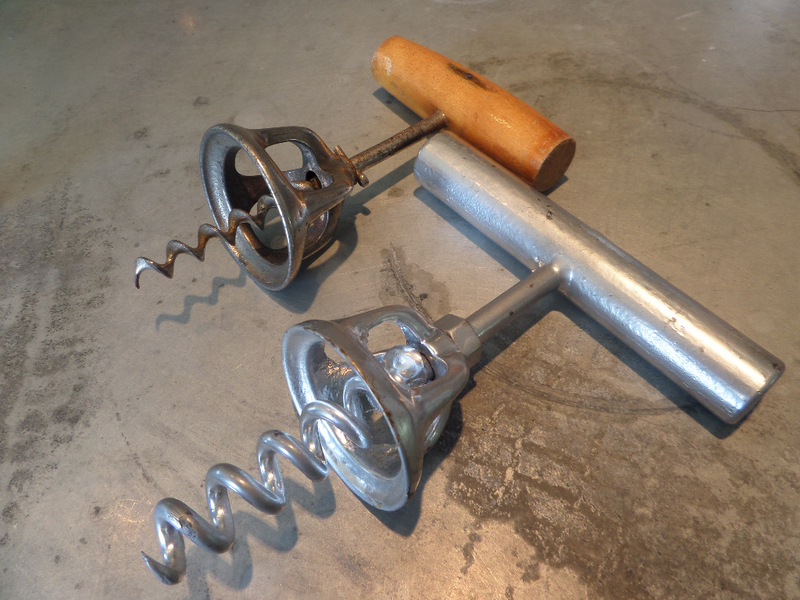 And, with a little coaxing, the helix moves into the middle of the handle for use! 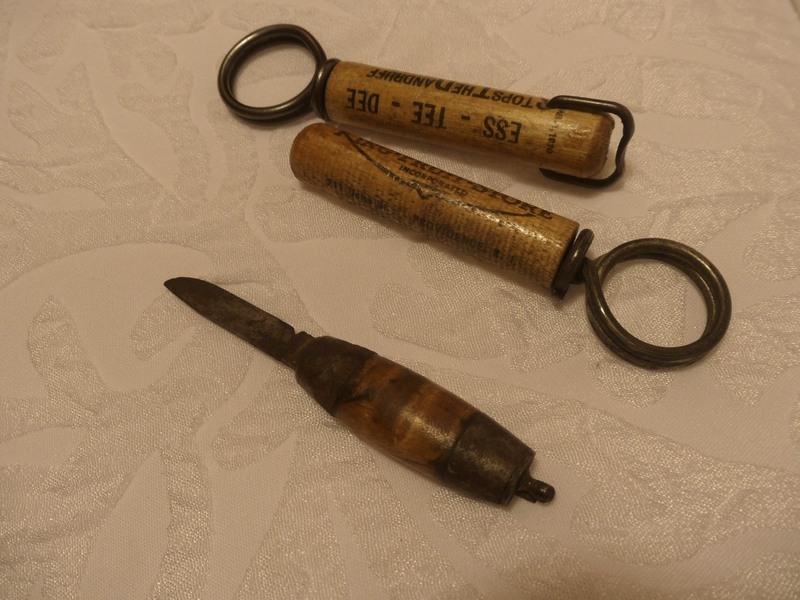 While at Ardingly with Petey, Webby, and Wally, I picked up a very small barrel knife (along with some corkscrews). 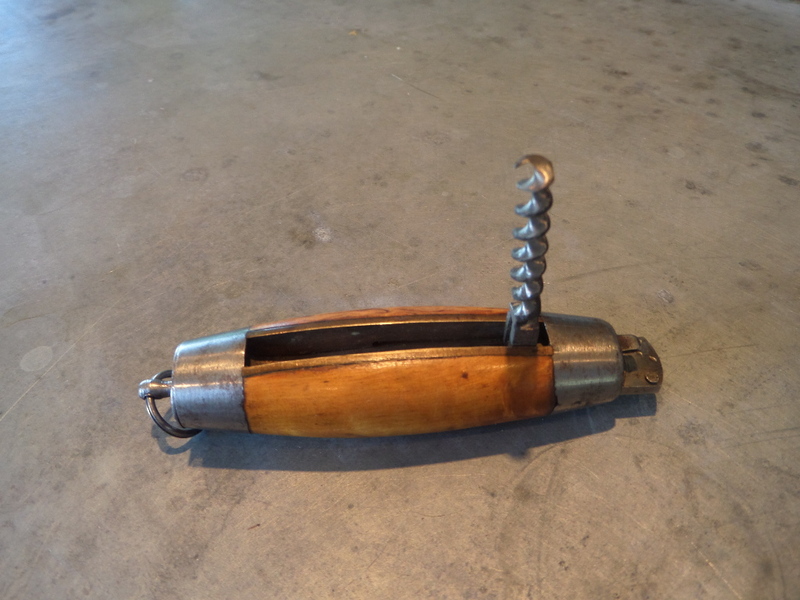 At Brimfield, I found another similarly sized barrel knife. 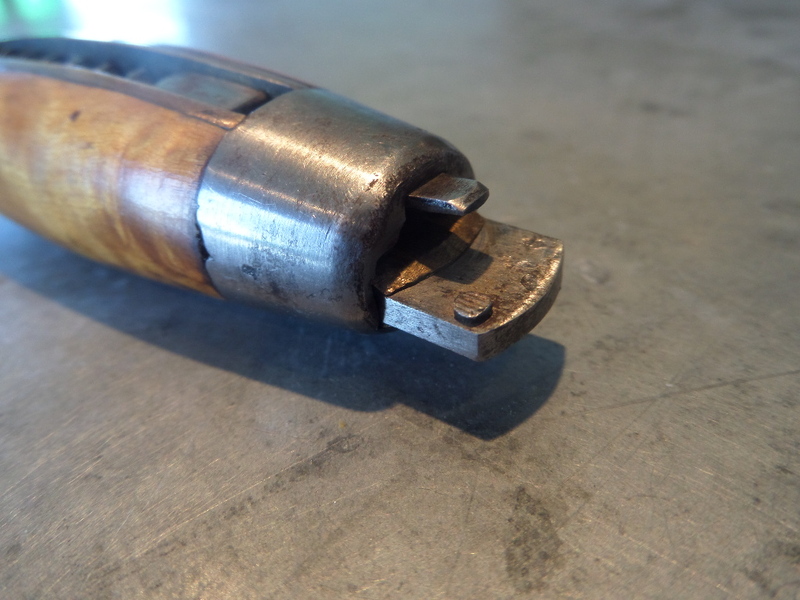 It was stuck in the open position, and with a little WD-40 and a little manipulation, the blade released, and it worked rather well. 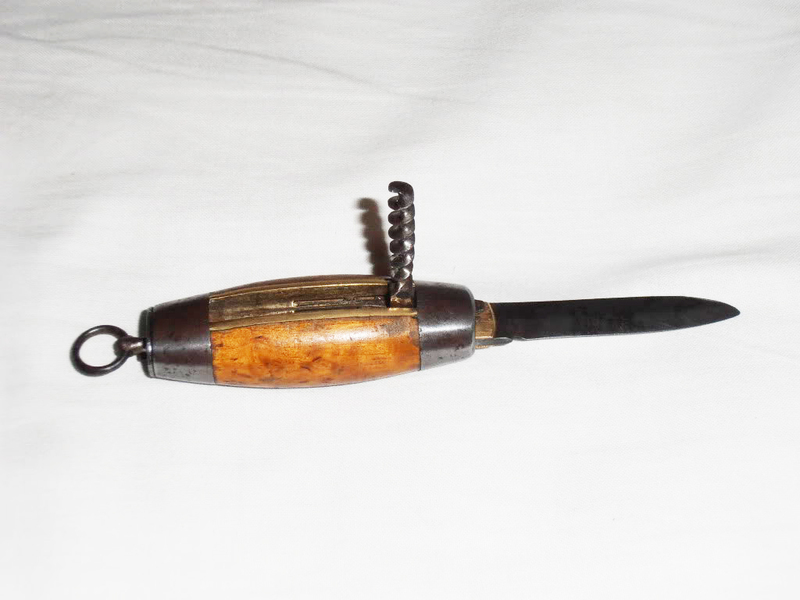 Still, of all the Swedish barrel knifes that I have looked at, the one that I have wanted for the collection is the one with the corkscrew. 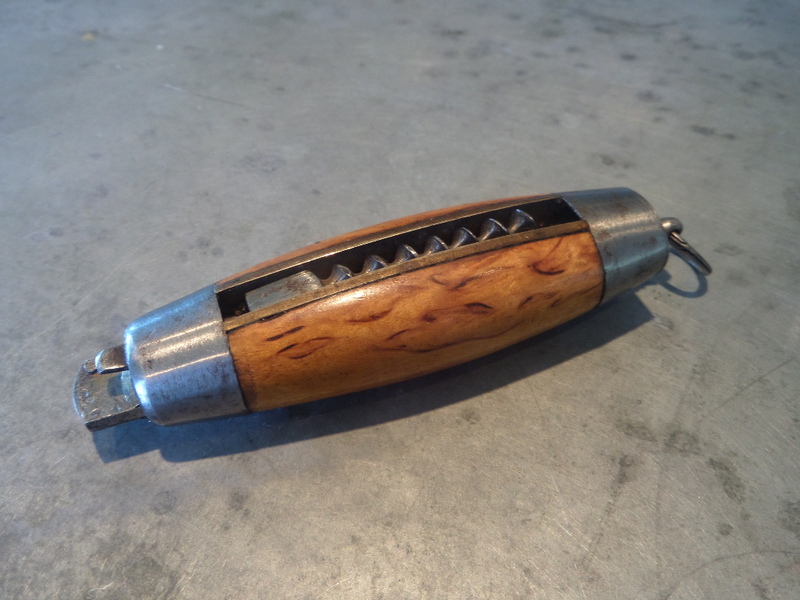 I keep hoping to run across one, and pick up every barrel knife that I see (not that you see many) with high hopes. 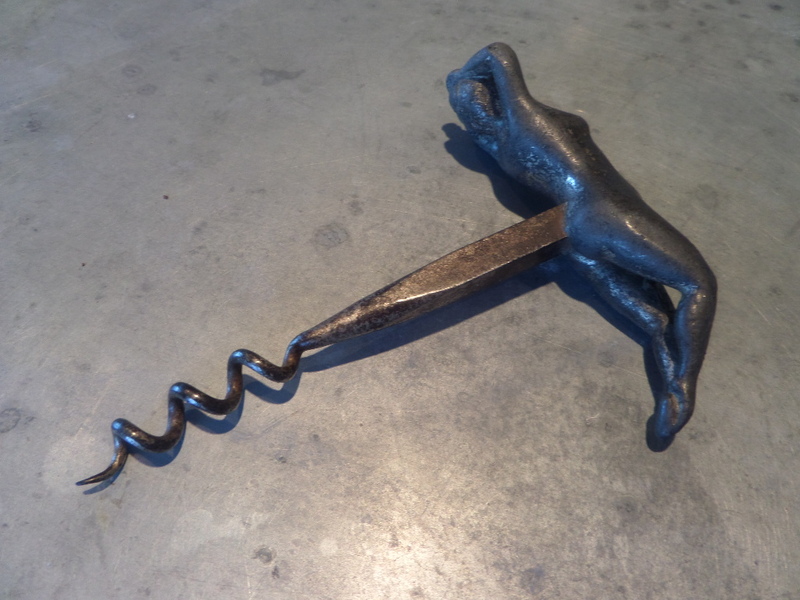 Still, one with a corkscrew attached has remained elusive. I was trying book a flight for St. Louis (more on this at a later date) when after getting frustrated with the outrageous prices (it is St. Louis after all), hopped on eBay for a moment. 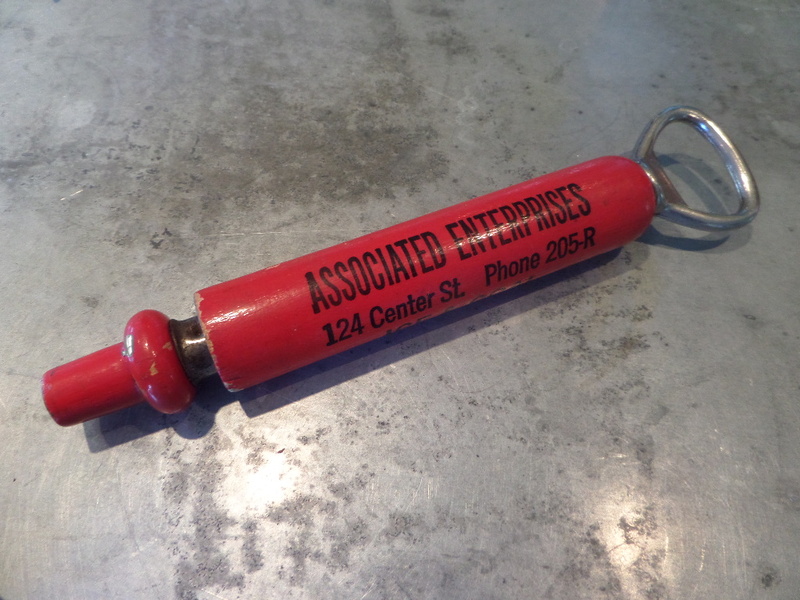 And, there it was…with a Buy it Now price of 20.00. 20.00!!!!!!!!! Are you kidding me?????? My heart started racing. I clicked the BIN button, hoping that that I was the first one to it. It went to shipping and payment information, so I thought I was home free. Except! The address programmed in was for Peter in England. Okay, delete, new address, type quickly! Okay, address entered correctly, payment sent. 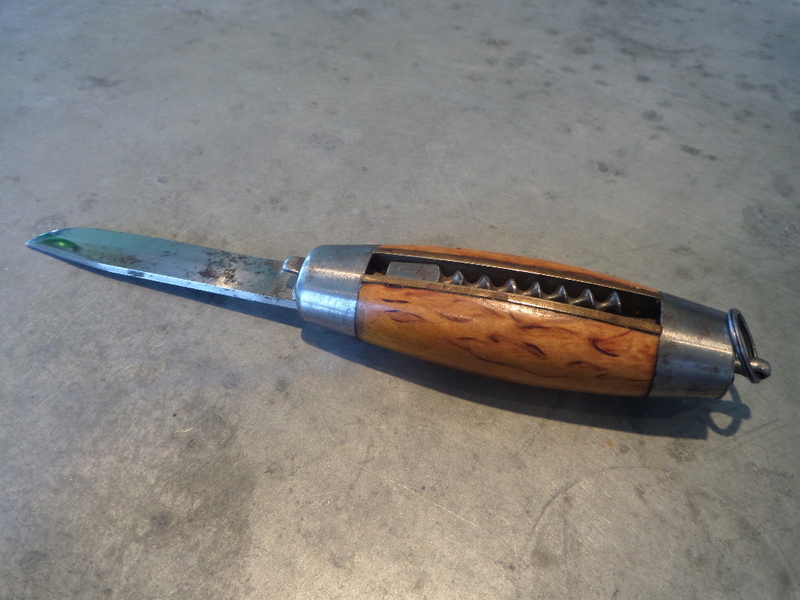 With my heart still racing, I went back to the listing, and realized there is no knife blade present. I will have the WD-40 at the ready! And, while I could do rather well with this one, this is going into the collection! And, with the Brimfield coming up (in July), the ICCA and CCCC AGM’s coming up in August, to be followed by yet another Brimfield, and of course the constant search, these are bound to change. 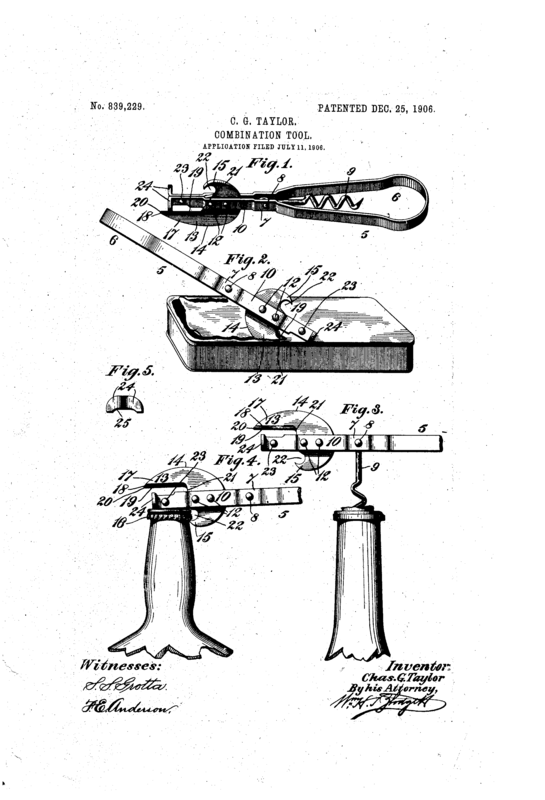 At this point in the year, the best 6 found (acquired) thus far would be the Folding Hicks and Reynolds, Trunk Patent, Maud’s Patent, Steel Alligator, Paradise/Mumble Peg, and at this point I am thinking the early Murphy with blade is an appropriate choice. 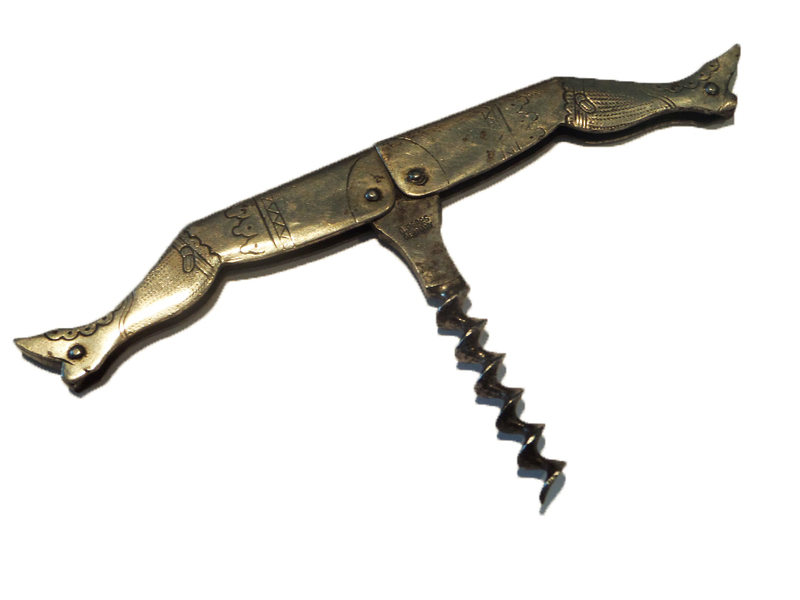 When we did our display of Murphy corkscrews in Boston a few years ago, none of us had this exact version). Of course, we are only halfway through, who knows what will turn up next! 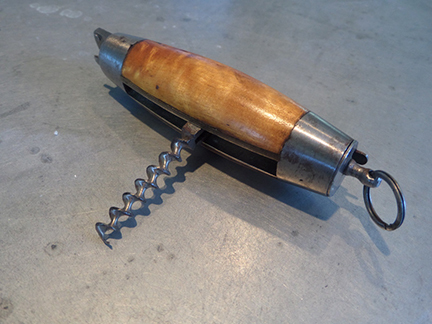 The other day a patented can opener with corkscrew was listed on eBay, with a decent buy it now price. And, ordinarily, I would have passed on a piece like this, but the advertising made it pretty interesting. 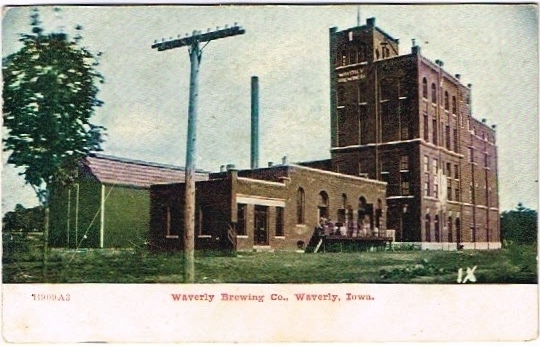 Now the opener is an American patent; Taylor’s 1906 patent, and I am sure I have a couple of those laying in a drawer, but the beer advertisement does make it pretty cool. I am guessing Tipped Worm Johnny already has this, so perhaps it will stay in the collection. As mentioned several days ago, I managed to win at auction (non-ebay) a pair of steel legs. And, after waiting for paypal and squareup to play nice, the auctioneer emailed to tell me that they were on their way. They arrived this afternoon, and they are awesome! They hinges on these are super tight, and open and close with an audible SNAP! In fact, I almost lost a finger then I closed them. The decoration is pretty nice too! The shank of the worm, is marked “D. 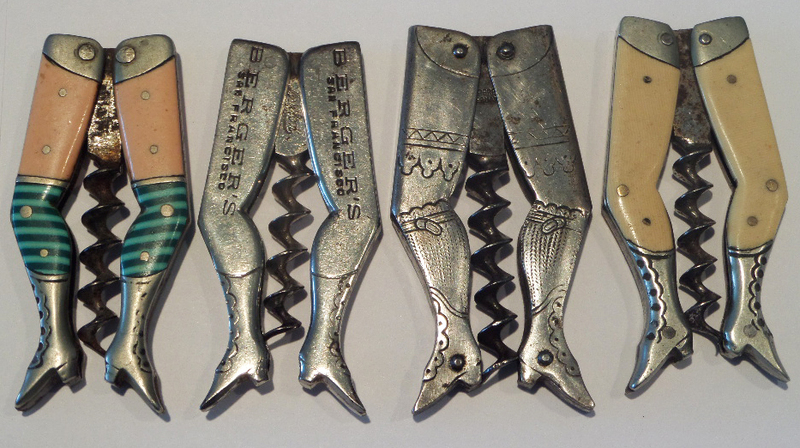 PERES, GERMANY,” and they are a fabulous addition to the collection. And, they are also a bit larger than the other pair of steel legs that I have. 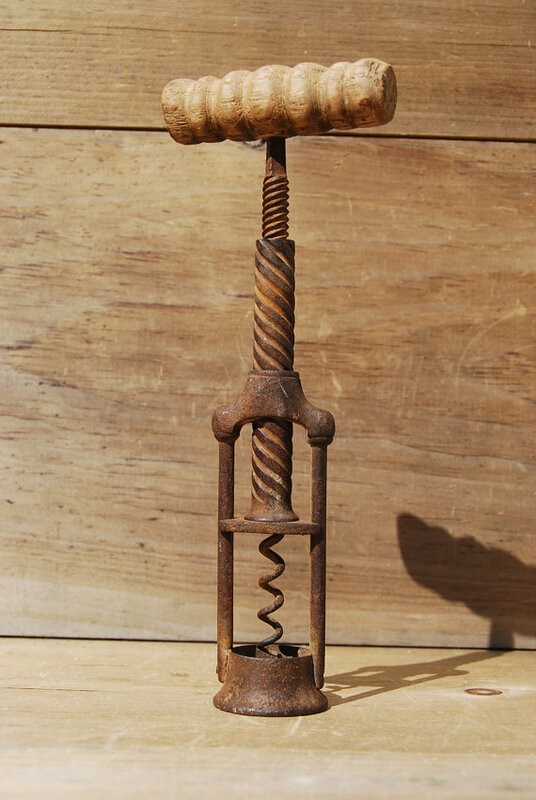 I was perusing an antiques website yesterday (with a second cup of coffee nearby) and I ran across an interesting looking two pillar corkscrew. It has a bit of rust and there is some pitting, but the worm looks good! 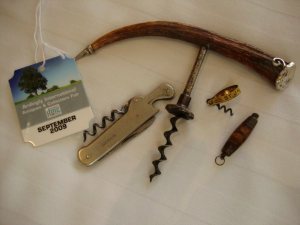 The problem is, the handle has been replaced. And, it isn’t a very attractive replacement. After posting a picture of it to the the usual suspects, it was within short order that Tommy called to ask if I wanted to flip it for a quick profit. 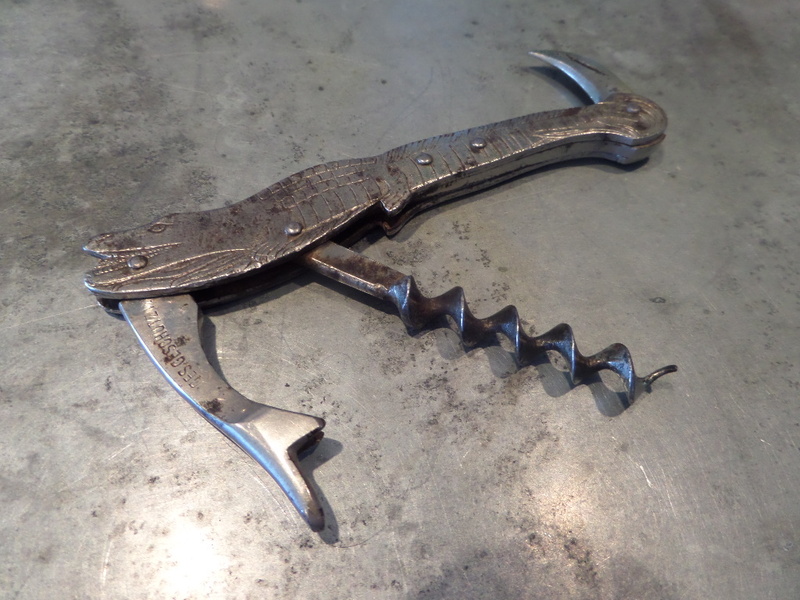 So, we went back and forth over the attributes of the corkscrew, the need of a handle replacement, pitting, rust, complete worm, potential value, and ultimately agreed upon a price. But, not before we quite literally flipped for it. At about 50 dollars a part, I asked if he wanted to flip a coin for it. I grabbed a nickel, and Tommy (on his phone in Chicago) called in the air. 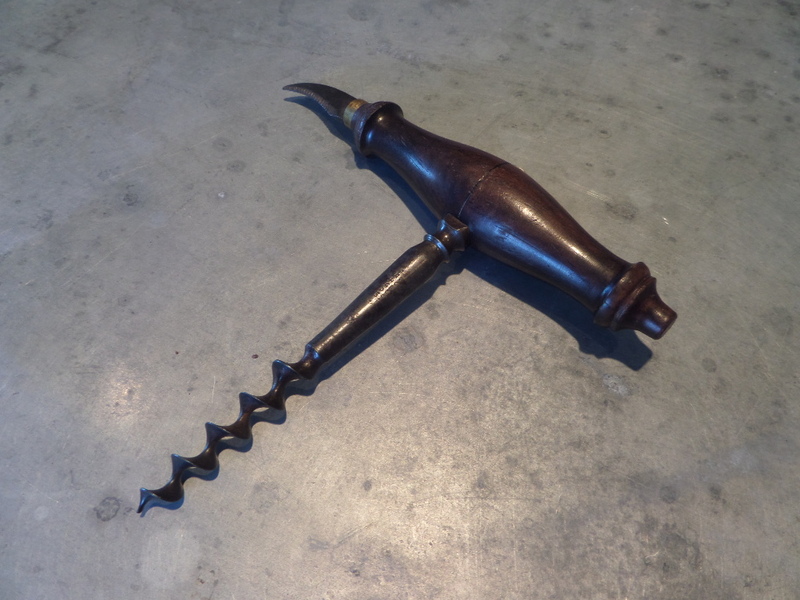 He paid up promptly, and I will send the corkscrew to Chicago, after it arrives. 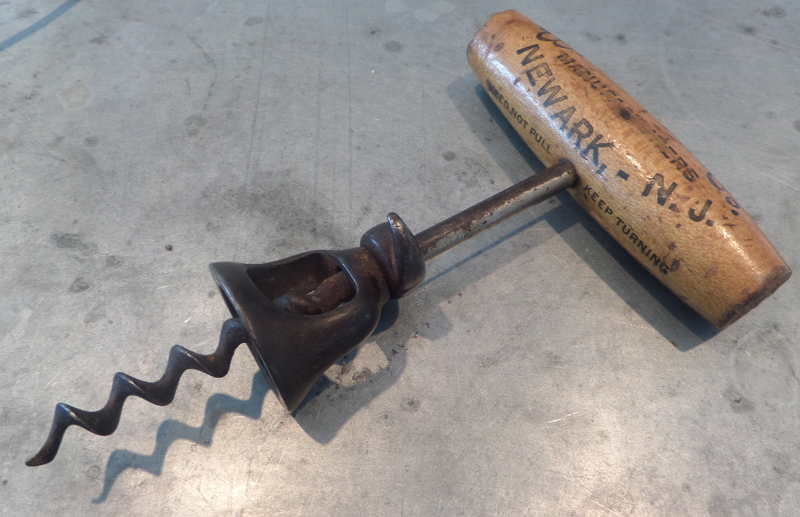 That said, it looks like Tommy is going to need an appropriate handle for this piece. Let the handle hunt begin! 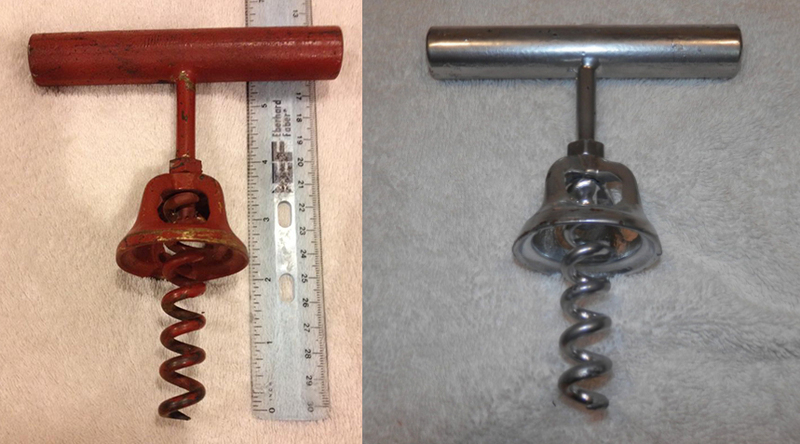 As mentioned Wednesday, I picked up a large bell corkscrew on eBay, and the corkscrew looked identical to one that Tommy had recently acquired. 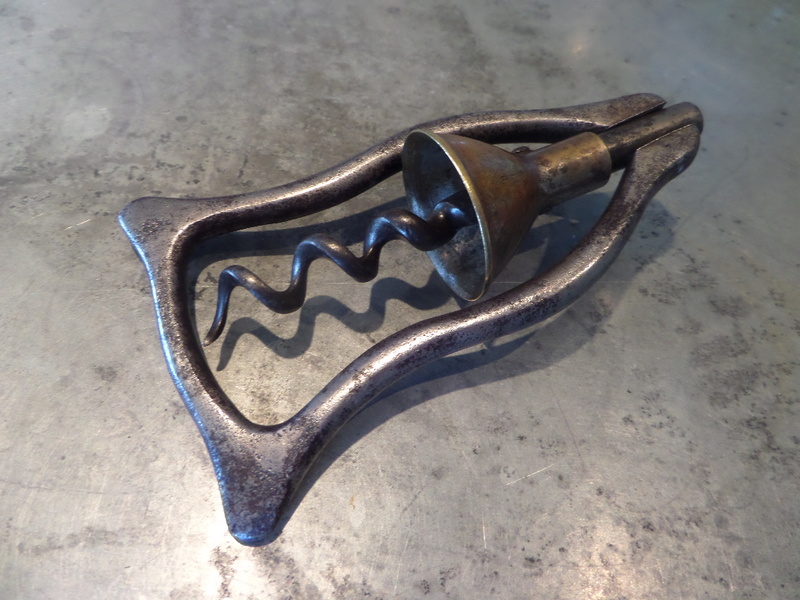 The large bell corkscrew arrived today, and it is pretty fantastic, with some interesting aspects to its construction. 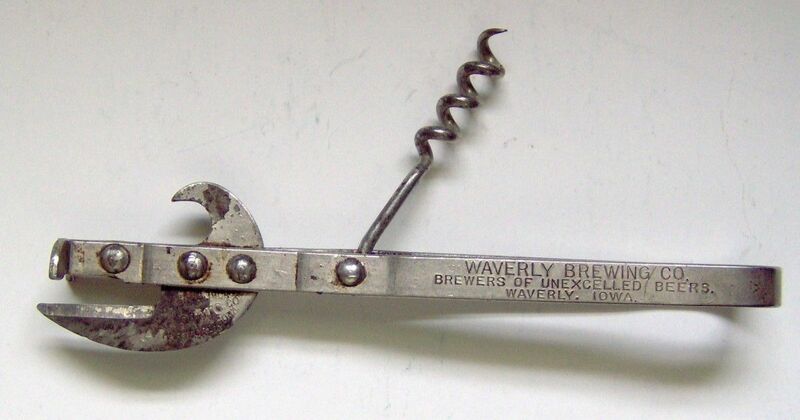 The handle is 5 inches across and hollow–the shaft continues through it, and there are some welds on top, and at the bottom of the handle. 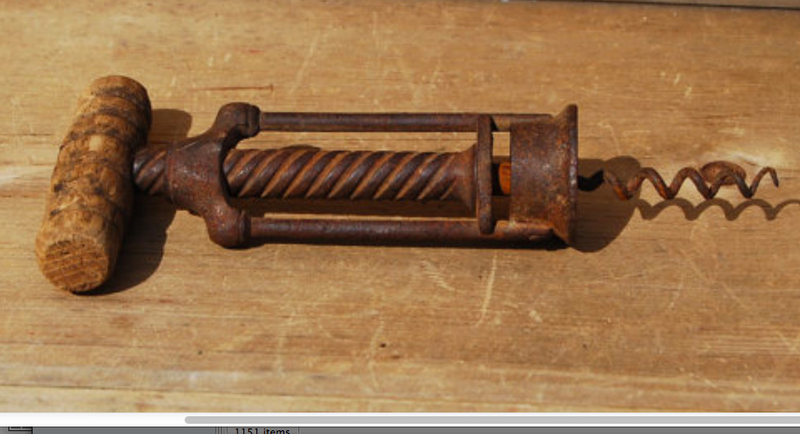 At the top of the bell, is a hex nut, and then the helix is welded on to the piece of metal that serves as the shaft. The helix has some pretty tight turns, but has a very nice sharp point. 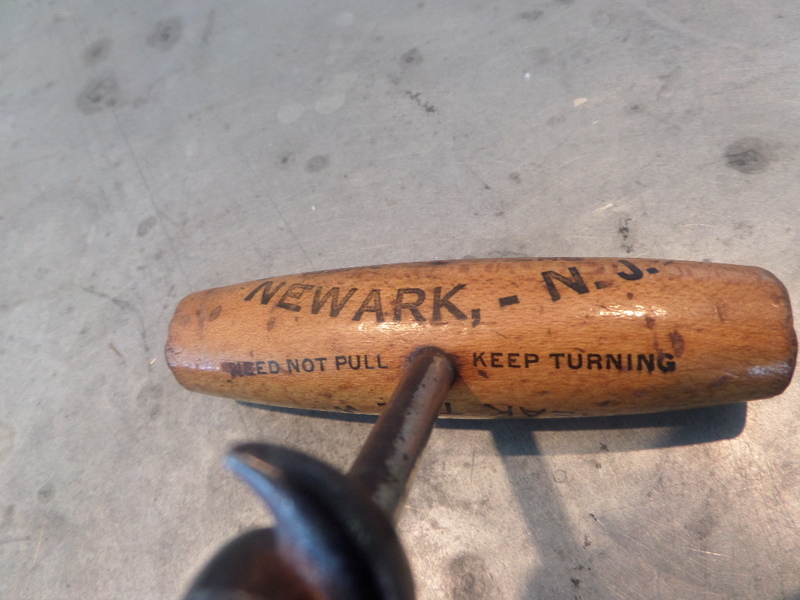 The bell itself, is 2 inches in diameter, and just shy of 1 1/2 inches high–not counting the hex nut. In comparing it with the oversize Williamson I have, the diameter is the same but the Williamson is slightly taller. I can completely understand why the seller deemed this as a shop project. That said, given that Tommy owns the identical piece, with the same aspects to its construction, clearly they were made by the same person/company. 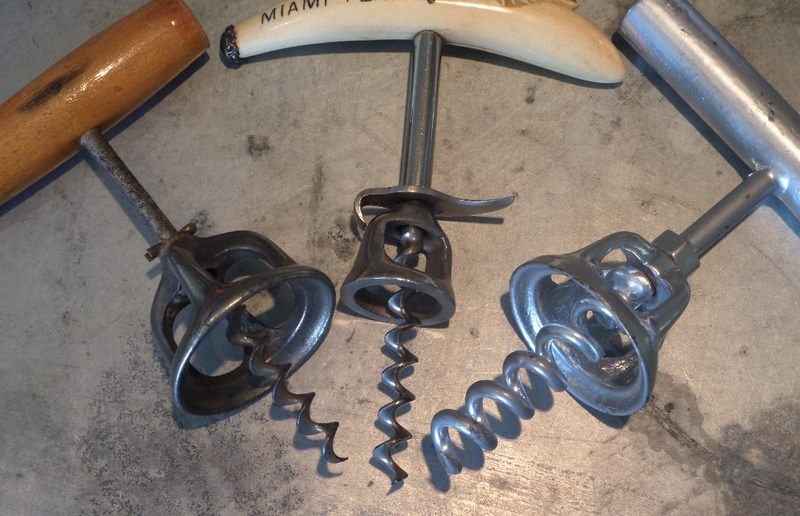 Could it be that someone bought the bells from Williamson to make their own corkscrew for bigger bottles? 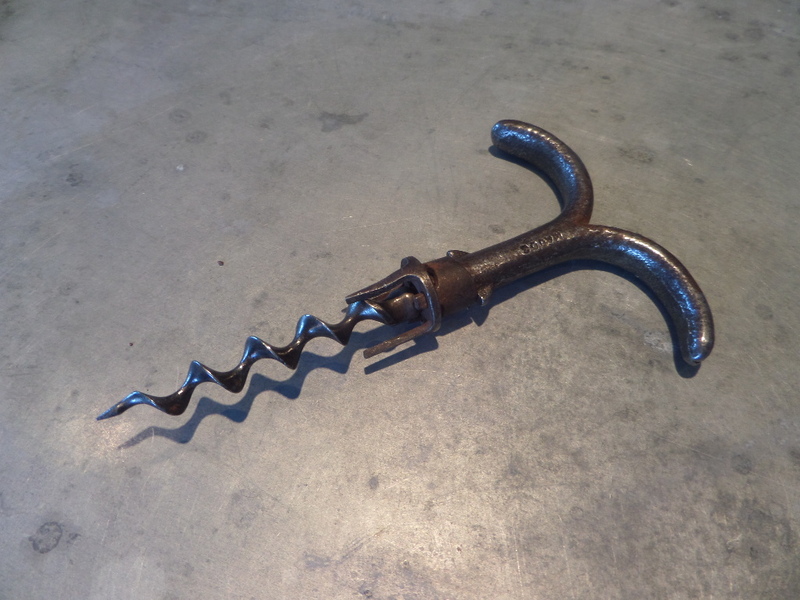 The corkscrew has been painted silver. And, I am tempted to use a little paint remover to see what might be revealed? Would you remove the paint?